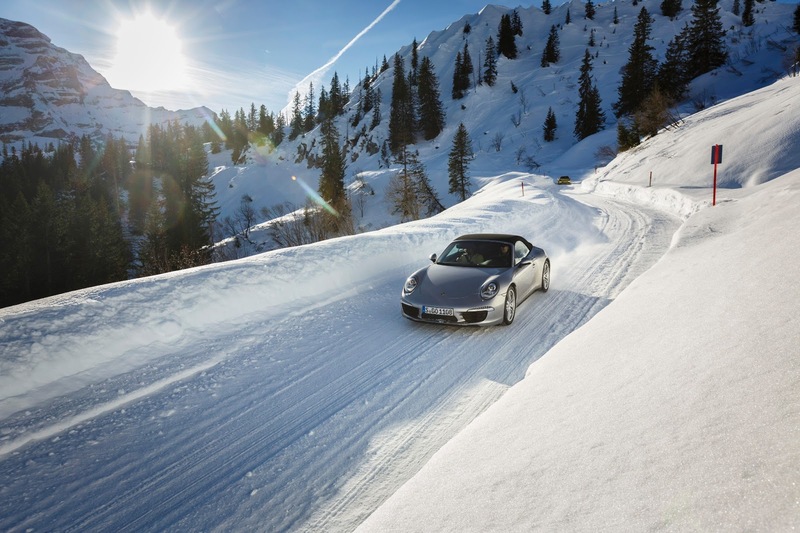 Now I will tell you with the latest Porsche Press Release, the German automaker has informed us that they delivered 656 cars to Switzerland in 2012 where the ice and snow is very predominant. Sometimes with the chill showing around minus 30°C. And for some reason, 42% of those 911 delivered to the cold region were Cabriolets! Figure how almost half of the people that want a 911 in a frigid climate want a convertible. I can only think that their tops are down about 3 months out of the year, and the heated seats are always on. So Porsche has listened and understood their customers and have developed one of the nicest convertible tops ever. With such a long cold season in Switzerland, the drop top lovers also fancy the sleek and sound resinating cabin feel of a regular Coupé to help keep warm. Therefor, Porsche has designed the external material of the cabriolet to be lined in its entirety by an insulating mat. The lateral parts are also completely covered with material so no technical components are visible any more when the top is closed. In conclusion, with Porsche's all-wheel drive system named Porsche Traction Management (PTM), and the convertible top down just throwing snow around while it blasts you in the face would be an experience you would never forget. I would have a goofy wool hat and some nice Oakley goggles.